Closing On A High Note? In a year that many investors are happy to see come to an end, US equities are looking to finish off 2018 on a positive note. Keep in mind, though, that there are still 7.5 hours between now and the closing bell. Today, we discuss where we think this rally is going next in the short-term, China’s grim manufacturing data, and the dismal performance of equities around the world this year. We’ve discussed the market’s extreme oversold breadth readings a number of times here and in various reports over the last couple of weeks, but it really is hard to appreciate just how extreme things have been. Another case in point is the S&P 500’s 10-day A/D line. Readings below -1,500 in this indicator aren’t particularly common and usually don’t last long as they are indicative of deeply oversold markets. Heading into today, though, this indicator has been below -1,500 for eight straight trading days. That’s nearly unheard of! 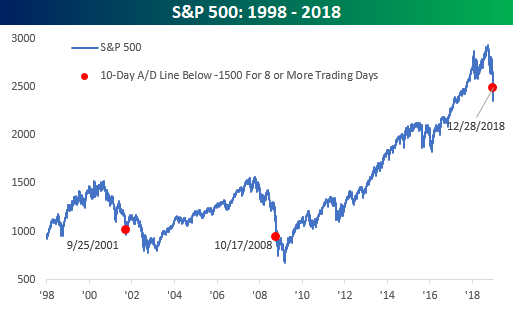 In fact, the only two other times since 1990 that the indicator has been below -1,500 for as long were in September 2001 after the World Trade Center attacks and then in October 2008 in the middle of the Financial Crisis. Each of those periods is indicated with red dots on the chart below. While both occurred well into a major decline in equity prices, neither occurrence marked an actual low in the market.